, a learned divine, usually, but perhaps not very strictly, classed among nonconformists, | was born in September 1599, at Kirton, near Boston in Lincolnshire, where his father was minister. He was, at fourteen years of age, matriculated of the university of Cambridge, being admitted of Emmanuel college there. 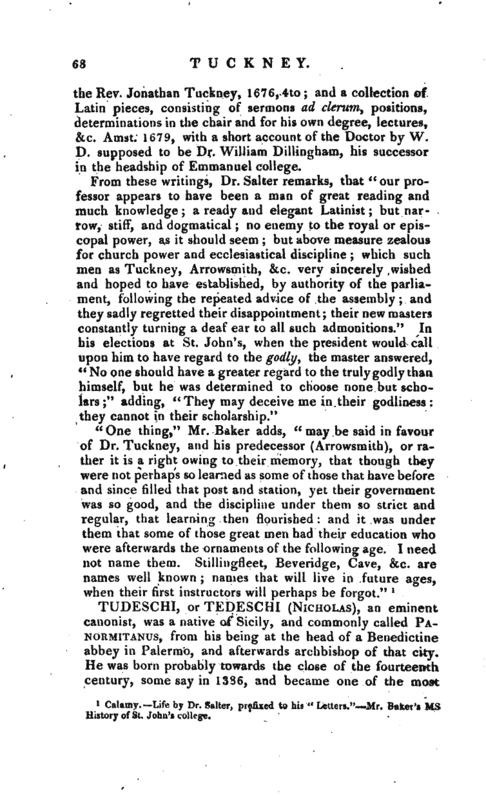 His biographer, Dr. Salter, remarks that this circumstance “shews that he had been educated hitherto in a dislike to the church establishment; for that college, though it abounded for many years in most excellent scholars, and might therefore very justly be esteemed and flourish on their account, yet was much resorted to for another reason about this time; viz. 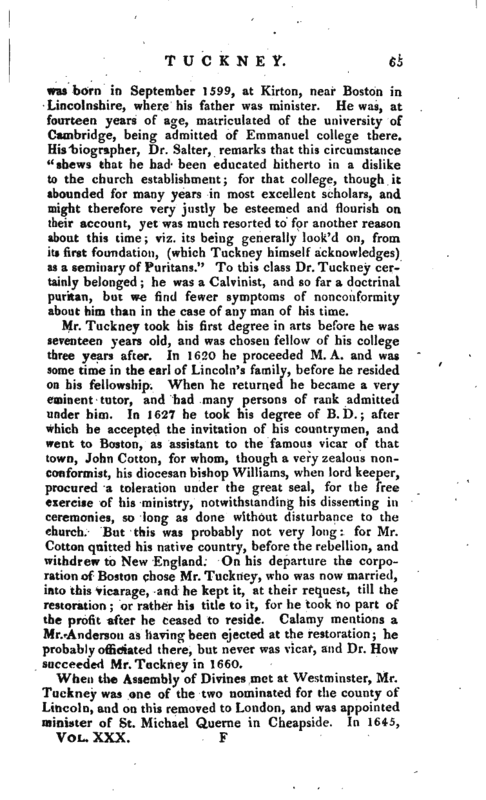 its being generally look’d on, from its first foundation, (which Tuckney himself acknowledges) as a seminary of Puritans.” To this class Dr. Tuckney certainly belonged; he was a Calvinist, and so far a doctrinal puritan, but we find fewer symptoms of nonconformity about him than in the case of any man of his time. Mr. Tuckney took his first degree in arts before he was seventeen years old, and was chosen fellow of his college three years after. In 1620 he proceeded M. A. and was some time in the earl of Lincoln’s family, before he resided on his fellowship. When he returned he became a very eminent tutor, and had many persons of rank admitted under him. In 1627 he took his degree of B. D.; after which he accepted the invitation of his countrymen, and went to Boston, as assistant to the famous vicar of that town, John Cotton, for whom, though a very zealous nonconformist, his diocesan bishop Williams, when lord keeper, procured a toleration under the great seal, for the free exercise of his ministry, notwithstanding his dissenting in ceremonies, so long as done without disturbance to the church. But this was probably not very long: for Mr. Cotton quitted his native country, before the rebellion, and withdrew to New England. On his departure the corporation of Boston chose Mr. Tuckney, who was now married, into this vicarage, and he kept it, at their request, till the restoration; or rather his title to it, for he took no part of the profit after he ceased to reside. Calamy mentions a Mr. Anderson as having been ejected at the restoration; he probably officiated there, but never was vicar, and Dr. How succeeded Mr. Tuckney in 1660. 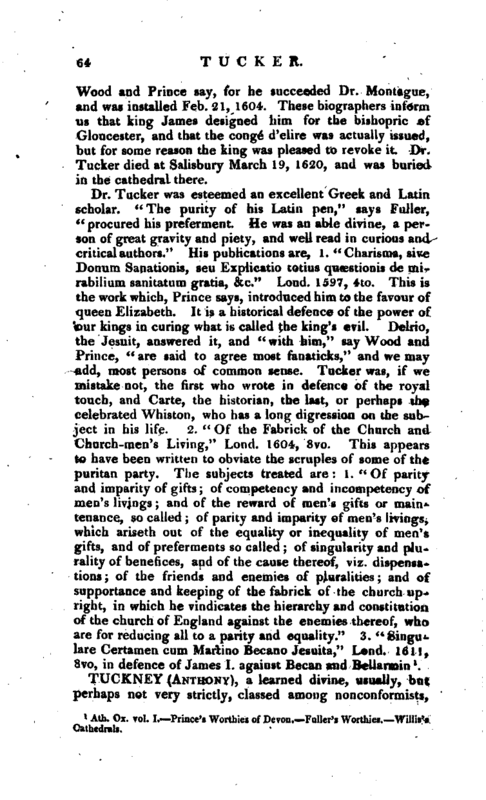 When the Assembly of Divines met at Westminster, Mr. Tuckney was one of the two nominated for the county of Lincoln, and on this removed to London, and was appointed minister of St. Michael Querne in Cheapside. In 1645, | when the earl of Manchester turned out Dr. Holdsworth, master of Emmanuel college, Mr. Tuckney was appointed to succeed him, but did not entirely reside on this employment until 1648, when being: chosen vice-chancellor he removed with his family to Cambridge, served that office with credit, and commenced D.D. the year after. While vicechancellor, Mr. Baker informs us, that he was very zealous for the conversion of the Indians, and the propagation of the gospel in America, and promoted these designs very vigorously with the assistance of the heads of the other colleges. In 1653, Dr. Hill master of Trinity dying, Dr. Tuckney preached his funeral sermon, and on the removal of Dr. Arrowsmith to Trinity college, was chosen master of St. John’s, and two years after regius professor of divinitv. 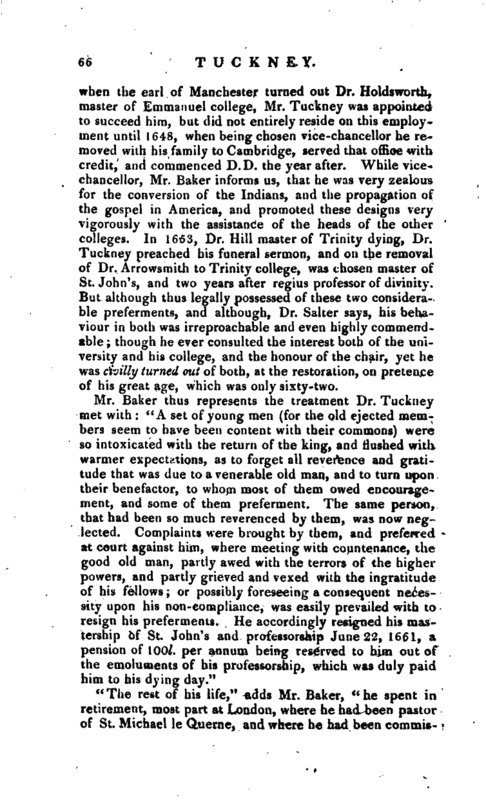 But although thus legally possessed of these two considerable preferments, and although, Dr. Salter says, his behaviour in both was irreproachable and even highly commendable; though he ever consulted the interest both of the university and his college, and the honour of the chair, yet he was dvilly turned out of both, at the restoration, on pretence of his great age, which was only sixty-two. 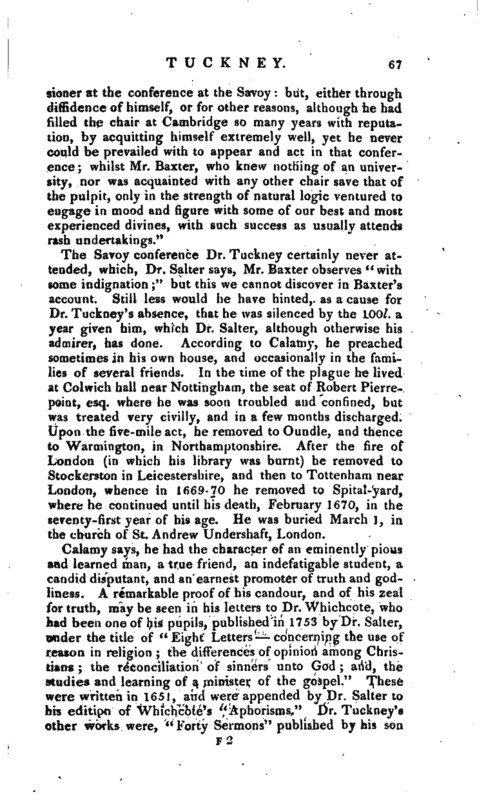 The Savoy conference Dr. Tuckney certainly never attended, which, Dr. Salter says, Mr. Baxter observes “with some indignation;” but this we cannot discover in Baxter’s account. Still less would he have hinted, as a cause for Dr. Tuckney’s absence, that he was silenced by the 1 Oo/. a year given him, which Dr. Salter, although otherwise his admirer, has done. According to Calamy, he preached sometimes in his own house, and occasionally in the families of several friends. In the time of the plague he lived at Colvvich hall near Nottingham, the seat of Robert Pierrepoint, esq. where he was soon troubled and confined, but was treated very civilly, and in a few months discharged. Upon the five-mile act, he removed to Oundle, and thence to Warmington, in Northamptonshire. After the fire of London (in which his library was burnt) he removed to Stockerston in Leicestershire, and then to Tottenham near London, whence in 1669-70 he removed to Spital-yard, where he continued until his death, February 1670, in the seventy-first year of his age. He was buried March 1, in the church of St. Andrew Undershaft, London. Calamy says, he had the character of an eminently pious and learned man, a true friend, an indefatigable student, a candid disputant, and an earnest promoter of truth and godliness. A remarkable proof of his candour, and of his zeal for truth, may be seen in his letters to Dr. Whichcote, who had been one of his pupils, published in 1753 by Dr. Salter, under the title of “Eight Letters concerning the use of reason in religion; the differences of opinion among Christians; the reconciliation of sinners unto God; and, the studies and learning of a minister of the gospel.” These were written in 1651, and were appended by Dr. Salter to his edition of Whichcote’s “Aphorisms.” Dr. Tuckney’s other works were, “Forty Sermons” published by his son | the Rev. Jonathan Tuckney, 1676, 4to; and a collection of Latin pieces, consisting of sermons ad clerum, positions, determinations in the chair and for his own degree, lectures, &c. Amst. 1679, with a short account of the Doctor by W. D. supposed to be Dr. William Diliingham, his successor in the headship of Emmanuel college. Calamy, Life by Dr. Salter, prefixed to his “Letters.” Mr. Baker’s ms History of St. John’s college.